Superheroes sometimes have capes and can fly. Others wear strange costumes. Retired Lt. William “Bill” Knapp only had a parachute, and a land mine strapped around his waist. “Of course, we had a lot of other stuff, too,” he said. 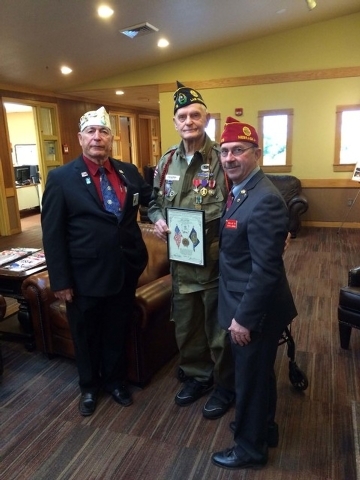 On March 25, Knapp and several others were honored by the American Legion at the Nevada State Veterans Home in Boulder City for the work they do for American veterans. He makes it a point to attend funerals for those buried at the Southern Nevada Veterans Memorial Cemetery who have no family to attend. He can be seen most Thursday mornings quietly saluting the passage of yet another hero. Also, as a member of the Patriot Guard he will attend funerals where protests are expected to disrupt the services. He honors those veterans because he knows what it means to serve in the nation’s military. Several hours before the Allies stormed the beach at Normandy, Knapp and his compatriots parachuted behind enemy lines to secure roadways, cut down communications wires and generally disrupt the flow of tanks that might be sent by Adolf Hitler to stop the invasion. “Of course, as we all know Hitler didn’t believe the invasion was real, so he didn’t send his Panzer divisions to stop us,” Knapp said. He joined the Army after high school. Knapp volunteered for pilot training the day after Pearl Harbor was bombed, and because he didn’t have a college degree he was not selected. He did, however, score high on the placement testing and was selected to become a paratrooper. After training, his unit was sent to Ireland and eventually to England. He smiles wryly when he remembers the steam-powered buses and trucks not having enough power to carry everyone up the hills, “so we would all get out and push,” he said. During his time in the military Knapp often didn’t let anyone know where he was. He gets a chuckle from the story of how his dad was at the movies and during the preshow activities saw him on a Fox movietone news short. “Dad was so excited that when he told Mom they had the theater owner open up and show the clip special for her. 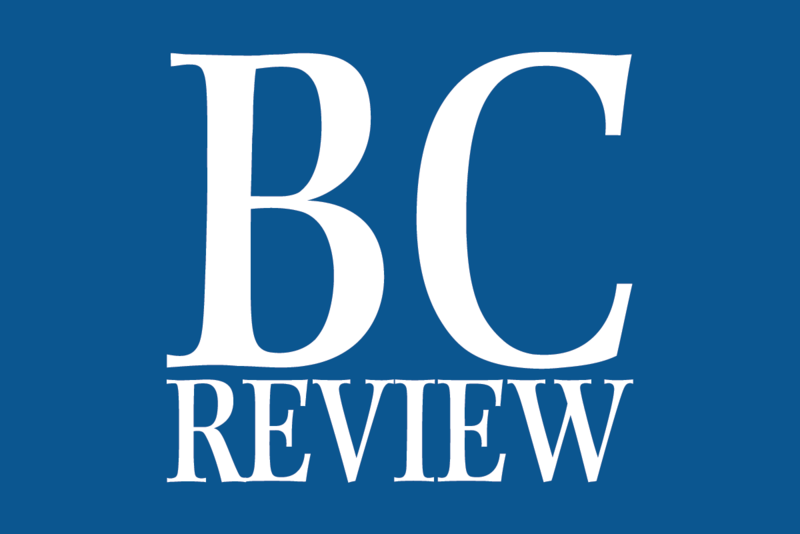 Unfortunately the video was lost and no copy exists,” he said. During that time “our job was to cut off the Cherbourg Peninsula and to take the town of Sainte-Mère Église,” in France. While waiting in England for the next assignment, Knapp did some skating exhibitions and showed the award-winning talents he picked up as a kid in the Midwest. His next jump was into Holland in September 1944. But if you look at his uniform the medals and commendations tell a different story. He also has a Croix de Guerre presented to him by Gen. Charles de Gaulle, while representing his unit. 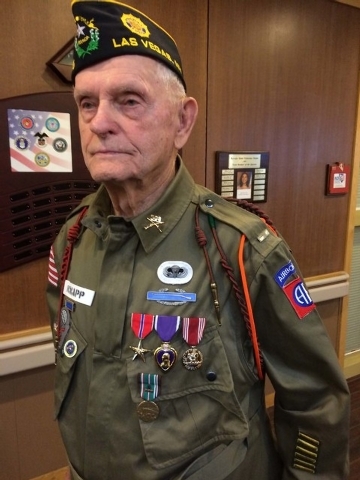 The Bronze Star is another tale. During the Battle of the Bulge “we were near an ammunition supply and an artillery round struck some of the ammo. It started going off, and I hollered we need to get that put out. So me and three other guys went over and put it out. I was so embarrassed to be the only one to receive the star,” he said. He received a battlefield commission, from sergeant to second lieutenant, in Holland but even that he trivializes. “The reason I got that was because we lost so many of our officers. That damned bridge, we were constantly under artillery fire so we lived in our foxholes,” he said. During the war, Knapp made many friends. One of his best friends was Joe Endress. “Joe and I were about as close as friends could be and we were talking one day when Joe ran out of pipe tobacco. I went back to my tent to get some and an artillery shell landed on Joe’s tent,” he said.